The UN’s Broadband Commission for Digital Development has identified Internet access as key to development, quality of life and as one of key indicators of economic growth. It also ranks177 countries according to their national broadband policies and how Internet access and use is impacting their populations and economic growth by country. The Report further evaluates the roll-out of broadband around the world and tracks progress on the affordability of this service across countries. 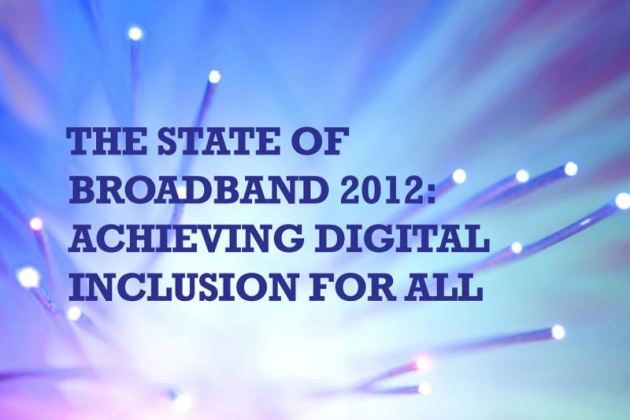 The State of Broadband 2012: Achieving Digital Inclusion for All Report reveals that while household Internet access has grown over the past year, individual Internet use continues to lag behind. ITU analysts believe that mobile broadband could be the platform that would help boost accessibility as it is a widely used technology. At the end of 2011, there were already almost twice as many mobile broadband subscriptions as fixed broadband connections. The Report outlines ways in which broadband is improving the lives of people around the world in terms of health, education, and payment systems, as well as the ways in which it is promoting innovation and fostering the acquisition of new skills. It also highlights the importance of partnerships between the public and private sectors, stressing the need for clear policy leadership to facilitate the deployment of broadband around the world. The Report presents twelve recommendations from the Commission to speed up the roll-out and deployment of broadband to accelerate progress towards achieving the Millennium Development Goals (MDGs), and includes 24 ‘featured insights’ from the Commission, which comprises 60 leaders from industry, government, international organizations and NGOs. Also See: “Broadening Broadband Internet Acess”.